Getting the most from a sit-stand workstation by Cynthia Roth. When the office workstation was transformed by the computer in the early 1980s, it was believed the proper ergonomic positioning was a static, seated posture with the body positioned using the 90-90-90 rule. As the name suggests, this rule had the back-thigh angle at 90 degrees, the thigh-leg angle at 90 degrees and the leg-foot angle at 90 degrees. By the 1990s, it was determined that a more neutral seated posture had all these angles being greater than 90 degrees. In the 2000s, it was found that sitting for long periods of time in a neutral posture did not prevent discomfort. Movement, such as leaving your workstation at least once an hour for five to ten minutes, needed to be performed since frequent position changes help prevent work-related musculoskeletal disorders. Today, good ergonomics practice dictates that some computer workers should work in a variety of postures to include sitting and standing. A sit-stand workstation is part of the evolution of the computer workstation so let’s explore the rationale behind sit-stand workstations, why they can be beneficial, how to design a sit-stand workstation, and discuss who would benefit from such a workstation. In the past few years, the number of sit-stand workstations has increased. The prevalence of this type of workstation is causing people to ask if a sit- stand workstation is right for them. More people than ever before are working on computers, which translates into the computer workstation needing to adapt to more types of computer users. For example, people are working later in life and they may not be able to stand for long periods of time due to stress and trauma placed on their back over their lifetime. Conversely, there is a younger work population that has spent their whole life with computers. These workers are accustomed to working on computers in non-traditional postures and locations. Whether due to physical condition or working preference, more is expected out of today’s computer workstation. There is a perception that sitting is not hard on the back, but this is not entirely true. Sitting when working involves a backward rotation of the pelvis, which, in turn, alters the curve of the back creating more disc pressure. Standing when working can cause stress to the back because muscle groups in the legs, hips, back, and neck are tensed when standing for a long period of time. Also, maintaining the same standing posture for long periods of time places the muscles in a constant state of contraction. A sit-stand workstation was developed to incorporate the benefits of both a seated and standing posture, with the ultimate goal being a computer user not having to choose between sitting and standing. A good ergonomic practice is adopting a variety of good postures throughout the workday. In fact, some ergonomists say “your best posture is your next posture”. Exceptional height ranges to accommodate all workers. Easy to move positions to make minor adjustments throughout the day. Easy to reach work equipment and other items. These design features can be accomplished many ways by the use of one or more of the following items: bi-level adjustable desk, keyboard tray with at least a 12-inch vertical range of motion, monitor arms, and, if allowed, wireless keyboards and input devices. You must be in a good standing posture when working at a sit-stand workstation. Be sure your neck is not tilted up or down when looking at the monitor, your arms and forearm are in a neutral posture (an elbow angle at or above 90 degrees will avoid nerve compression at the elbow), and your feet are firmly on the floor. Also keep in mind that research on sit-stand workstations is not complete. Although evidence suggests that there may be a reduction in back discomfort, the literature notes that past studies have not used adequate comparison groups. Additionally, there is no evidence that sit-stand workstations improve wrist posture when typing or mousing. 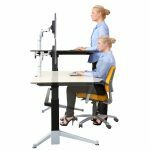 Logically, the real benefit of sit-stand workstations is just that, changing between sitting and standing Do I need a sit-stand workstation? This is a question many employees will ask of their health and safety professional. If that’s you, maybe this response will help. If you are currently happy with your workstation design, experience little or no back discomfort, have a job that requires you to frequently leave your desk during the course of the day, or have flexibility in your work schedule to leave your desk when you want, then you are most likely not a candidate for a sit-stand workstation. If your employees experience difficulty sitting for 30 minutes or less, they are likely candidates for a sit-stand workstation. We also recommend that if a sit-stand workstation is being purchased, that it is easy to adjust and encourages an individual to change positions frequently. The answer to whether to sit or stand is more about the need for movement and changing postures hourly. Static postures breed ergonomic risk factors which breed potential for poor productivity and, more importantly, the potential for a workers’compensation claim. A sit-stand initiative requires training. This is a very important component. Training will explain the whys and hows as well as understanding of the risk factors. This is necessary for employee compliance, comfort and productivity.